Promote your event and provide guests with all the important details they need to get there. Share all the details on a mobile-friendly page that can be customized based on your theme. Describe your event, display the date, address, venue information, link to Google Maps for directions and add a button to purchase tickets or register. From the page, guests can save the event directly to their calendars and contact you for more information. Advertise via print or online with a personalized QR Code and short URL. When I introduced my Event QR Code to the office, we were amazed in no time. Customization let us capture our corporate look, as if we developed the page by ourselves. Find out everything you need to know about the Event Code from how to create it to advertising your QR Code and short URL. Need some inspiration? Check out these clever ways to advertise your Event Page. Marketing is a key aspect of event planning, and sometimes the hardest element of all. Even if you've organized the most captivating speakers, enlisted as many exhibitors as possible, and scheduled world-class entertainment, if the event marketing goes wrong, nobody will turn up. Event planning professionals need to use every tool at their disposal to attract people to their events, whether they are music festivals, tech conventions, or local craft markets. While using web directories like Eventbrite, maintaining email lists, and mastering social media are important, we've come up with something that could be the most effective item in an event planner's toolkit: Event QR Codes. Let's find out more about what they are and how they can promote your event. What Is an Event QR Code? As you are probably aware, QR Codes are square portions of posters, adverts or web pages which look a little like the white noise on television screens. When smartphone users scan them with their cameras, these codes are translated into links which take the phone user to a specific web location. Traditionally, this type of code has mainly been used in conjunction with adverts or to promote competitions. But they are just as useful for event marketing, with the right infrastructure behind them. Our Event QR Code systems allow planners to do two things. Firstly, they make it easy to create slick event invitations, including buttons to add events to calendars, links to Google Maps, and compatibility with Eventbrite. Secondly, they include an Event QR Code which can be used in printed event marketing material. With these two features at your disposal, you can take care of both the digital and real-world aspects of planning an event, instead of running both campaigns separately. Our system will generate a specific QR Code for every specific event. It could be something as routine as a monthly business get-together for your sales team, a one-off gig featuring your band, or a charity barbecue. Whatever the event, you can create invitations online and send them out in seconds. The physical QR Code can then be used for a whole host of additional marketing tasks such as ticketing or poster distribution. For example, when you print out physical tickets for a music festival, the code can feed customers to sites that include information about the acts or directions to the venue. Ticketing codes can also help customers access your customer support - making everything run that bit more smoothly. As we mentioned earlier, when you start an Event QR Code campaign with us, you won't just receive a code on its own. The idea is that the QR Code acts as one more element of a successful event planning campaign, and it is intended to work with the other parts of the package. For instance, when you provide details about the time, location, and nature of the event, we will create a dedicated page for that event, which every attendee can visit. You can add whatever buttons you require, including the option for attendees to instantly add the event to their calendars. And you can handle Eventbrite ticketing with ease, sending out e-tickets or print versions - whatever makes the most sense. Finally, the whole system has been designed to automatically optimize your event planning pages for a wide range of mobile devices. So, if attendees are using tablets or smartphones, it doesn't matter. The page will look great, with every piece of information clearly displayed. Whether you are a professional event planner, or just arranging a single event, QR codes could be a crucial part of your strategy. Almost everyone on your invitations list will use a smartphone and be familiar with how these codes work, and they can be used for everything from ticketing to registration. Use all of the methods available to turn invitations into attendees. With the tools available from QR Code Generator, you can maximize the chance of everyone turning up. 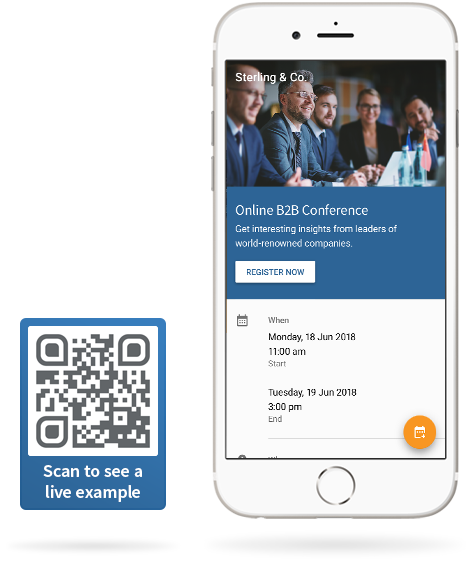 When your Eventbrite ticketing system, advertising, registration and customer support all work together, your event will attract much more attention - so explore what QR Code Generator can do for you.